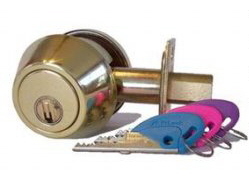 We are often called in by homeowners to find cost-effective solutions for door repairs. Often a home owner may be trying to sell their property and an inspection reveals items that require to be fixed before a sale can take place. 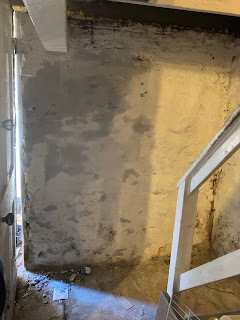 The images below show a basement door on a 100+ year home, where the door butts up against the cinder block foundation wall. 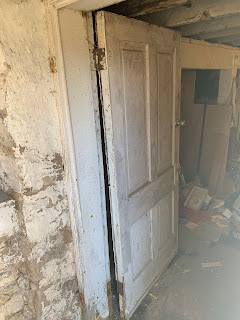 this door opens inward and as you can see, the top of the door hits the floor joist, not allowing the door to travel fully. The home owner had attempted to simply replace the hinges, but their attempted repair failed because the wood in the frame was rotten and the screws wouldn't hold. 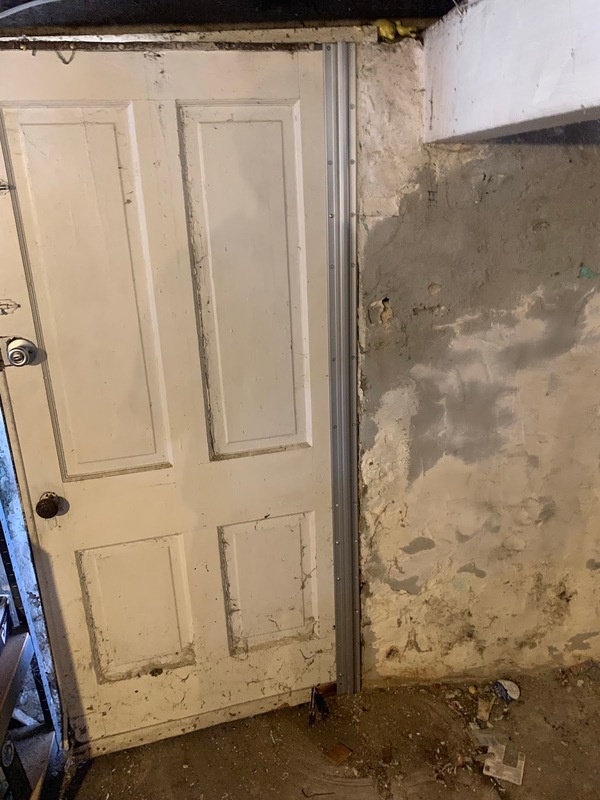 Typically in this situation, the recommended solution would be to replace the entire door and frame. that can be a costly endeavor, especially because many similar situations require custom made doors and frames, that are often quite dear. 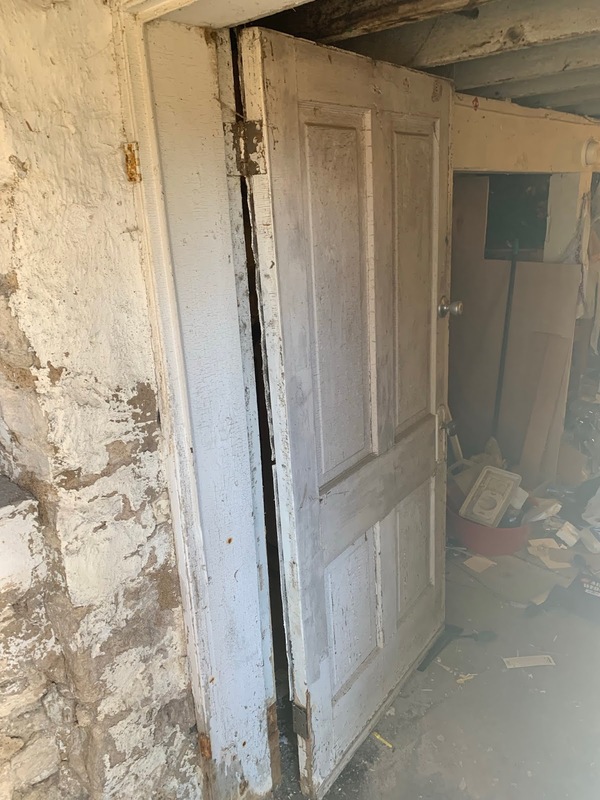 The first image shows the door detached from the frame at the bottom and you can see the top of the door is taller than the floor joist. the second image shows the external side of the same door. You can see that the old door is in a state of disrepair and the hinge at the bottom has nothing to screw to. We could have simply moved the hinge higher to a new location, but we couldn't be sure that the wood was not also rotten there too. Our solution is a long term fix because the continuous hinge we installed (which is more often used to repair shopfront aluminum doors) comes with a 50 year warranty. The completed installation of the continuous hinge, required us to cut about 4" from the top of the hinge. The continuous hinge is screwed on like a typical piano hinge, in that it applies completely along the edge of the door and frame. 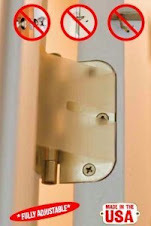 The correct installation of a continuous hinge ensures long term use. they are held to both door and frame using about 10 screws on each leaf. We installed it to the surface of the door and frame, which allowed us to screw into fresh (not rotten) wood. The finished result looks great and the door works easily like it should. Total time for repair ~2 hours. Continuous hinges are not cheap. 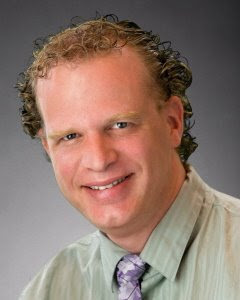 But quality products are often pricey and come with sometimes lifetime guarantees. We continue to install increased quantities of continuous hinges to shopfront aluminum doors, where the top and/or bottom pivots wear quite quickly. A continuous hinge is the most cost-effective and simple repair method for many single door applications and the products are not limited to just shopfront aluminum applications. 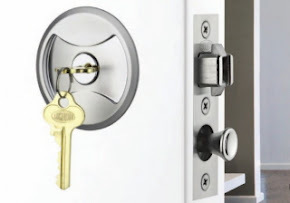 Contacting your local locksmith would be your first stop in getting quality professional door repair services, with technicians that can advise the different options.